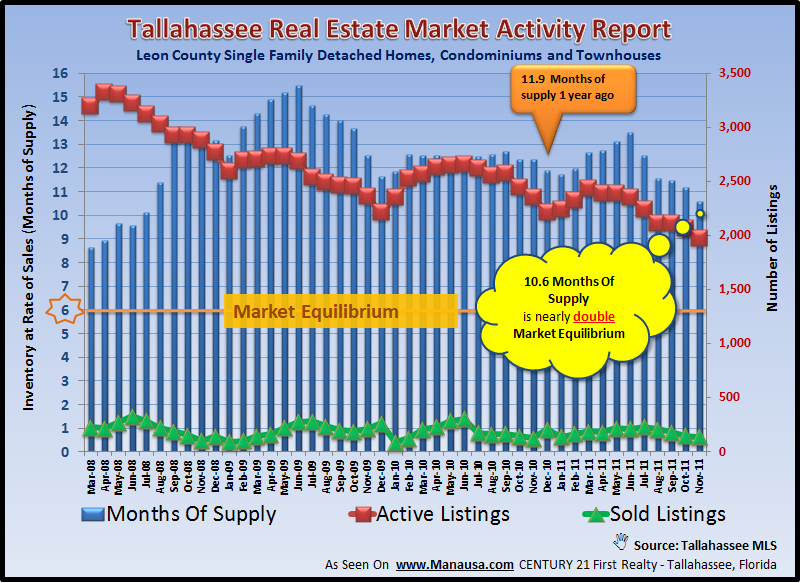 The following real estate graph and tables demonstrate housing supply and demand dynamics in the Tallahassee real estate market as of December 4, 2011. Each area of Tallahassee (Leon County, Florida) is summarized with homes for sale, homes that have sold over the past 12 months, and finally the relative supply of homes for sale (measured in “months of supply”). Currently, there are over 10 months of supply of homes on the market in Tallahassee, and though the relative supply fell again last month, it was more due to seller's who have not yet re-listed than it was for homes being sold. High levels of relative home supply will continue to put pressure on home prices until we see market inventories stabilize at the 6 months of supply level. If you would like to receive a free monthly market update, just subscribe to the Tallahassee Real Estate Newsletter and it will be delivered to your email inbox each month.